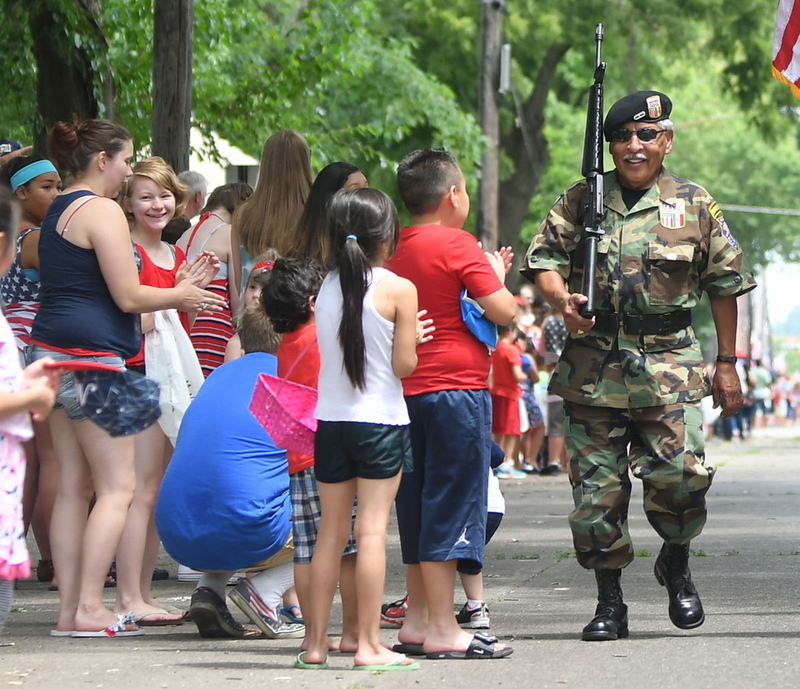 Thousands of Quad-Citians dressed in red, white and blue packed themselves along 15th Avenue for the 59th annual AMVETS Fourth of July Parade. The parade, which was put on by the Rock Island Arsenal Chapter of Association of the United States Army and the City of East Moline, included just shy of 50 entrants from local organizations and businesses, and it took about an hour from start to finish. The regulars include veterans organizations like the Korean War Veterans Association, Vietnam Veterans of America, Mexican-American Veterans Association, and the Civil Air Patrol, as well as American Veterans, the group that first started the parade 59 years ago. “It’s a little bit smaller than in years past, but we have a lot of new entries, meaning that there are more new people that want to be involved, which is exciting,” said Deana Woodall, organizer of the entire event. Woodall works for Event Solutions Group and has been brought in by AUSA’s Rock Island Arsenal Chapter to organize the parade for the past three years. In addition to East Moline elected officials and representatives of the city’s fire and police departments, both the Democrat and Republican parties of Rock Island County were well represented at the parade, along with businesses such as Skate City and the youth soccer club QC Legends. The Rock Island Arsenal was represented by Col. Kenneth J. Tauke, garrison commander. Tauke served as master of ceremonies for the parade and rode in a Corvette with his wife. Even though Woodall was asked to take on the massive organizational role as part of her job, she said she really does it as a way to honor her country. Amid all of the political strife going on in Illinois and the rest of the nation, the parade offers a great way to forget about that for an hour and just celebrate what we have, Woodall said. Johnson, who became president of the AUSA chapter July 1, wants to continue the organization’s mission of advocating for service members and getting the community’s support, and she said that the parade is a great way to do that. Judging by the crowds, the parade is a huge annual success, and Woodall encouraged everyone in the area to come and see it in the future. “Everybody has a good time, everybody’s here for the right purpose and that’s to celebrate our country,” she said.